"For Congress, their family is their country. For me, my country is my family. The people of this country are the members of my family. To earn, it is only your blessings I seek. The Opposition is misleading people with their lives. People of India have lost faith in the Congress," said Modi in a stinging attack on the Congress. "BJP has worked for Dalits and OBCs and I promise we will keep doing the good work. Congress never cared about the welfare of people. The truth is, Congress and its allies always mock anything and everything that is being done for all the backward classes, tribals. They always act as obstacles in development," said Prime Minister Narendra Modi at the Baghpat rally. "With less pollution, less fuel-use, EPE will also help transport fruits and vegetables into NCR easily. Developing infrastructure is the way to 'Sabka Saath, Sabka Vikas'. For this our government has emphasised on electricity, roadways, highways, motorways." the prime minister said in Baghpat. "Taking problem of pollution seriously, our government has taken up the task to build a ring road of sorts around Delhi. The EPE will help reduce traffic congestion in Delhi. 50,000 vehicles will not have enter Delhi at all. EPE is also India's first green expressway," said Narendra Modi in Baghpat. 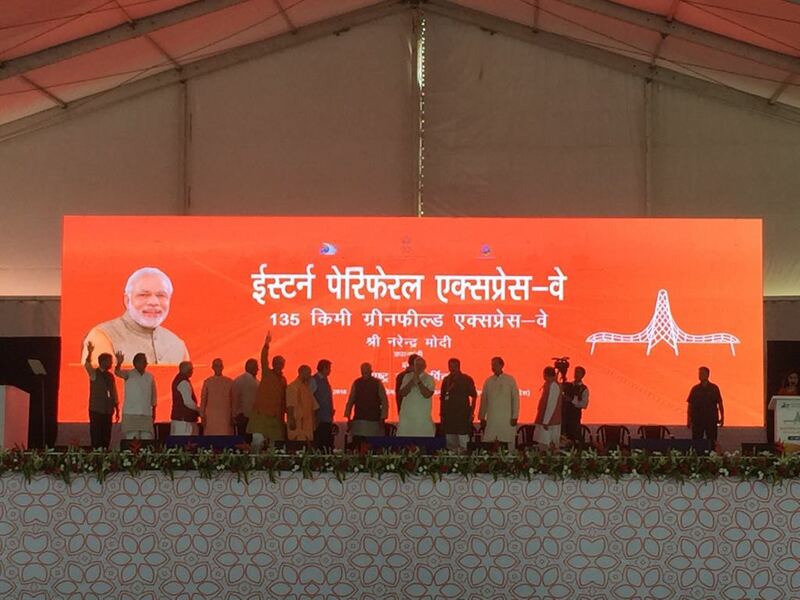 Prime Minister Narendra Modi inaugurated the 135 kilometre-long Eastern Peripheral Expressway on Sunday in Baghpat. It is said to be the India's first smart and green highway. 'Development' is at the centre of discussion on the stage in Baghpat. The Eastern Peripheral Expressway is being called as the " symbol of development". The crowd is chanting "Jai Shri Ram". Since the Muzzafarnagar riots, this area has been viewed as sensitive. Despite the tension between the sects, the locals here believe that the crowd cannot be polarised so easily here. Union minister Nitin Gadkari assured that Eastern Peripheral Expressway will be completed by March 2019. "The Supreme Court was monitoring the project. We paid Rs 6,000 crore for land acquisition to farmers. We are installing world's most advanced features in the EPE project," he said. Among those present at the Baghpat venue are Uttar Pradesh governor Ram Naik, Union minister Nitin Gadkari, Chief Minister Yogi Adityanath and Haryana chief minister Manohar Lal Khattar. Narendra Modi is expected to speak shortly. 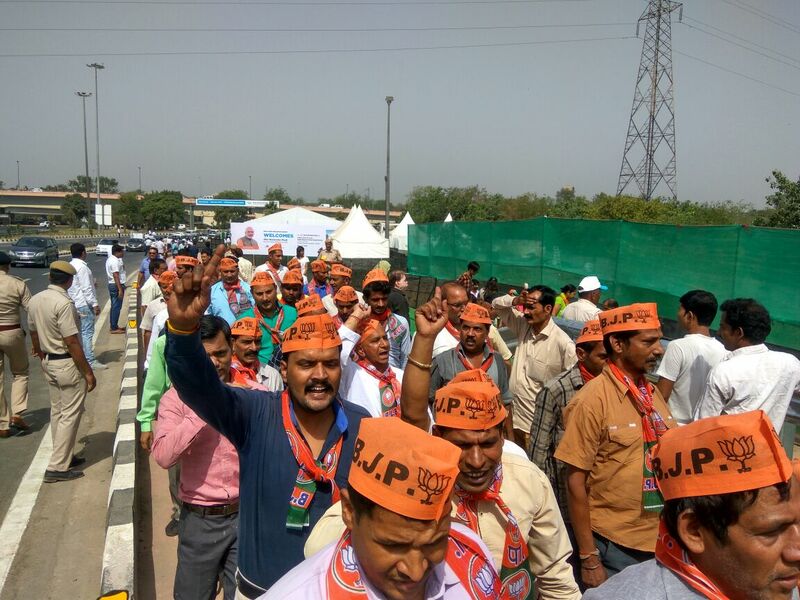 Despite the hot weather condition, BJP supporters have reached the Baghpat venue in large numbers. Narendra Modi has reached the place to address the rally. The energetic supporters at the venue are sure that the new expressway will lead to the development of the region. During his Mann Ki Baat programme, Narendra Modi ​congratulated D Prakash Rao, a small tea vendor from Cuttack who runs Asha Ashwaasan school and spends half his income on children living in slums and hut settlements. "Rao, from Odisha's Cuttack has been selling tea for the past 50 years. He spends 50 percent of his income on the education of more than 70 poor children. His life is an inspiration to all," Modi said. Narendra Modi remembered Veer Savarkar's contributions during Mann Ki Baat. "The month of May is associated with a historic event in 1857. While many preferred to call it only a Mutiny or a Sepoy Mutiny, it was Veer Savarkar who called it the First War of Independence. I pay my tributes to the great Veer Savarkar," he said. Narendra Modi spoke on the significance and importance of yoga. "The world celebrates 26 June as International Yoga Day. The world has seen the manner in which Yoga unites. We believe in yoga for unity and yoga for a harmonious society," he said. "Dust storms are unseasonal. In the last few weeks we saw what happens due to unusual weather patterns. India will do everything possible for a cleaner and greener tomorrow," Narendra Modi said during his Mann Ki Baat address. "This time, let us focus on tree planting," he appealed. While addressing the nation, Prime Minister Narendra Modi lauded the people who scaled Mount Everent in the recent weeks. "Who does not know what sense of adventure is? If we see the development journey of mankind, progress has arisen from the womb of some adventure. Development is born in the lap of adventure," he said. He also commended the BSF team for not only scaling Mount Everest recently, but removing loads of trash littered there and bringing it down as part of the ‘Clean Ganga-Clean Himalaya Campaign’. Narendra Modi's roadshow has caused massive traffic jam at NH 24 between Nizamuddin and Ghazipur. The prime minister's roadshow commenced from the Nizamuddin bridge, the start of the about 9 kilometre first leg of the Delhi-Meerut Expressway. He is scheduled to fly to Baghpat for dedicating the EPE to the nation and after a 6-kilometre travel on the stretch. "People of Baghpat, Meerut, Shamli, Muzaffarnagar, Bijnor know how much amount is still due to farmers for sugarcane. Doing a road show won't make farmers get their outstanding amount. The Eastern Peripheral Expressway was also inaugurated only after the Supreme Court order," said Samajwadi Party president Akhilesh Yadav. "I want to assure all the sugarcane farmers here that the government is sensitive towards their issues and is working to resolve all the problems," said Modi. "Under the Namami Gange program, the government is focused on ensuring that waste generated within cities does not end up in the river. The villages on the banks of the river are also being made open-defecation free," said the prime minister. 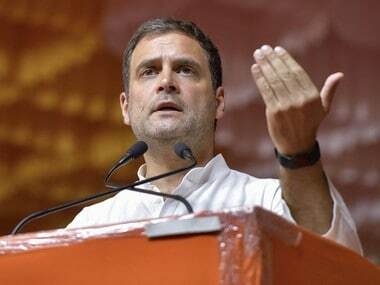 "For Congress, the country's development is a joke. If the government gives free gas connections for women, they make fun of it. The Opposition is shedding crocodile tears. All the work done for the poor, its all a joke to them, and they make fun of it. Today the people of India is watching how for political gain, the Congress tells lies to the Supreme Court. Be it about the SC/ST law or reservation, they try to manipulate people by spreading rumours. They are spreading rumours among farmers that 18 percent GST will be levied if they lease their land. A party, which has repeatedly lost elections, has the audacity to spread such rumours. Register complaint against them, and the law will take action against them," the prime minister said. "In the past four years, more than three lakh crores have been spent on new highways over 28 thousand kilometres. Till four years ago, where only 12 kilometres a day were formed, today about 27 kilometres of highways are being constructed," said Modi. "Through 'Make in India' campaign, manufacturing has received a boost. As a result, now there are 120 mobile phone manufacturing factories in India as compared to only two, four years ago," said Modi. "During their (UPA) time, only two factories produced mobile phones. Today, more than 120 factories produce mobile phones," Narendra Modi said. "After agriculture, more employment opportunities arise in Medium and Small Enterprises (MSMEs). For this, both state and Centre are working together. For example, UP's Yogi Adiyanath govt has undertaken the 'One District, One Product' initiative," said Modi. "Congress' UPA govt could connect only 59 panchayats with optical fibers. In the same time, we have done it for more than 1 lakh villages. How work is done, my nation is experiencing it right now," said Modi. Speaking at the Baghpat rally, Prime Minister Narendra Modi said the Centre has taken several initiatives to reform aviation services in the country. "Under the UDAAN programme, we want to connect remote parts of the country. We want people wearing hawai chappal to travel by hawai jahaaj (aeroplane)," he said. "Infrastructure does not differentiate on the basis caste, creed, religion and economic status," said Modi at the rally. Speaking of completing four years of being in power at the Centre, Prime Minister Narendra Modi said that the fact people turned out in huge numbers for the Baghpat rally, it showed how successful the last four years have been. "After four years of the central government, the Eastern Peripheral Expressway, is going to be a lifeline for the people of Delhi, and express my gratitude for Prime Minister Narendra Modi on behalf of the people of Uttar Pradesh," said Uttar Pradesh chief minister Yogi Adityanath. Addressing the rally in Baghpat, Haryana chief minister Manohar Lal Khattar thanked Prime Minister Narendra Modi for the infrastructural project. "Yesterday, the BJP government completed four years. I welcome the prime minister on behalf of the people of Haryana. We are preparing for the Lok Sabha polls in 2019 too. The foundation for this expressway was laid in Kundli in Haryana," he said. Ahead of Narendra Modi's visit to Baghpat to inaugurate the EPE, BJP supporter Vijay Mishra said that it would be a proud moment for the local BJP workers to have the prime minister there. On 21st June we will mark the #4thYogaDay. 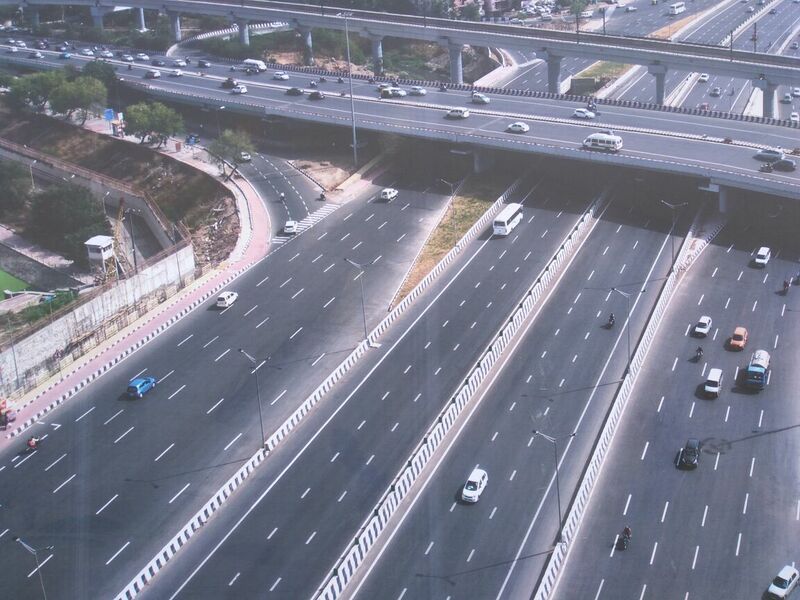 The first phase of the Delhi-Meerut Expressway will provide a major relief to the commuters in Delhi-Noida. It starts from Nizamuddin bridge to the Uttar Pradesh border having a 6 lane Expressway and 4 plus 4 lane highway. Speaking at the rally, Narendra Modi said the Eastern Peripheral Expressway will help save fuel and reduce pollution in NCR. "With less pollution, less fuel-use, EPE will also help transport fruits and vegetables into NCR easily," he said. Prime Minister Narendra Modi inaugurated Eastern Peripheral Expressway on Sunday in Baghpat. The 135-kilometre EPE, built at a cost of Rs 11,000 crore, has several unique features and is India's first highway to be lit by solar power besides provisions of rain water harvesting on every 500 metres on both sides and would showcase 36 national monuments and 40 fountains. Prime Minister Narendra Modi inaugurated 3D model exhibition on making of Eastern Peripheral Expressway (EPE) in Haryana's Kundli. He is scheduled to visit Baghpet to dedicate the EPE to the nation. The prime minister addressed the nation as part of the pre-recorded monthly radio programme, Mann Ki Baat on Sunday. 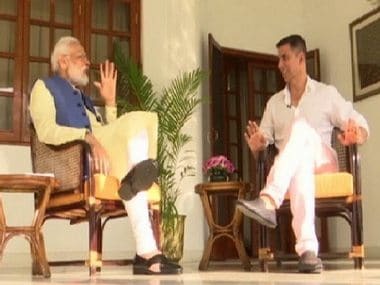 The prime minister talked about women empowerment, the response to the Fit India campaign and Virat Kohli' challenge in the 44th edition of the radio programme. 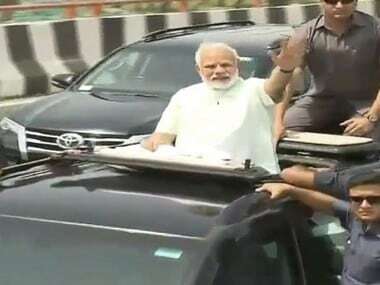 Earlier today, Modi, inaugurated the newly built Delhi-Meerut Expressway and embarked on a roadshow in an open SUV on the Delhi-Meerut Expressway. The Delhi-Meerut Expressway has been built at a cost of Rs 841 crore has vertical gardens with solar power on the Yamuna Bridge on this expressway. Modi's roadshow commenced from the Nizamuddin Bridge, the start of the about 9-kilometre-long first leg of the Delhi-Meerut Expressway, and after a 6-kilometre roadshow on the expressway, the prime minister will fly to Baghpat in Uttar Pradesh to dedicate another infrastructure project, the Eastern Peripheral Expressway (EPE), to the nation. "The prime minister would inaugurate the exhibition and 3D model there and would fly to Baghpat to dedicate to the nation the EPE," Minister of Road Transport and Highways Nitin Gadkari said on Friday. The 135-kilometre EPE, built at a cost of Rs 11,000 crore, has several unique features and is India's first highway to be lit by solar power besides provisions of rainwater harvesting on every 500 metres on both sides and would showcase 36 national monuments and 40 fountains. It has been completed in record time of 500 days.